Computer-controlled lifting and enhance the overall technology is an advanced steel structure and large equipment installation technology, which combines mechanical, hydraulic, computer control, sensor monitoring technology, and to solve the traditional craft and a large crane hoisting machinery in lifting height, weight lifting, structural surface access, job sites and other aspects of the problem can not be overcome. Using this technology is safe and reliable construction, mature technology, advanced technology, significant economic benefits. The technology uses a "flexible strand bearing, hydraulic cylinder cluster, computer-controlled synchronous lifting" principle. When lifting or jacking construction using computer precise control of each point of synchronization. Enhance or determine jacking scheme must be considered bearing structure (permanent or temporary) and was promoted steel or the device itself strength, stiffness and stability. To make the overall force structure under construction status checking mechanical performance and calculates the, put the point with Jack. For the construction of foundation or support structure and the lower carrying capacity should be checking with the overall stability, under the most unfavorable conditions to ensure adequate security. Sync value of each action point should be selected by calculating the reasonable construction. 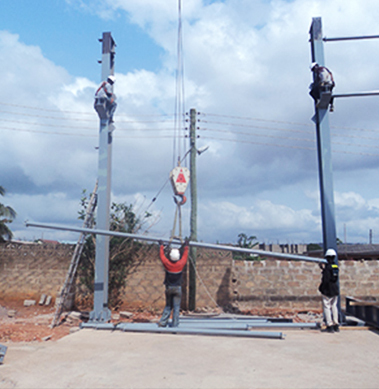 Ways to enhance the principles of choice, one seeks to reduce the height of load-bearing structures to ensure its stability, the second is ensuring the stability and lifting steel or equipment in place to enhance the security. Determine the upgrade point number and location of the basic principles are: first to ensure that the device was promoted stability in steel or upgrade process; under the premise of ensuring safety and quality, minimize lifting points; upgrade the carrying capacity of the device itself meet the design requirements . Lifting equipment selection principle is: to meet the requirements to enhance the force, compact, durable, easy to maintain, to meet project needs (such as stroke, enhance the speed, security, etc.). Slip method has broad applicability. In addition to one-way truss, but for smaller structural rigidity by increasing two-way truss or truss anchor (decrease span), increase the width of the assembly platform, while increasing the number of assembled truss on the platform, the same method can be used to install slip. Slip propulsion device can be computer-controlled synchronous hydraulic crawler. High degree of automation equipment, flexible operation, safety, reliability, using a wide face, versatility. Preparation of construction plan to guide the construction, including: slip unit division, assembly platforms and slide erection, assembly height, traction systems, slitting slip or cumulative slip, off the shelf in place, construction monitoring, contingency plans and so on. 2) high-altitude platform assembly and erection truss assembly. 3) Set the slip track. 4) Install synchronization slip systems. 5) stress and strain monitoring: to ensure that the construction in a controlled state. (1) sports stadiums, theaters, hangars, steel bridges (Gallery) and other large span roof and steel, with ground assembled condition, there are better peripheral support when conditions and can be used to enhance the overall lifting technique. (2) enhancing the overall steel tower mast antenna, power station boilers and other ultra-member. (3) enhancing the overall large gantry crane girder, boilers and other large equipment.